So. [Awkward pause here] This is me playing catch up on my income reports. Do you know when I’m writing this? June. 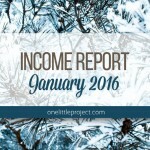 (I back dated it to February so I didn’t flood my home page with income reports). I know. 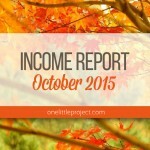 Apparently committing to these income reports each month was a lot harder than I thought it would be. 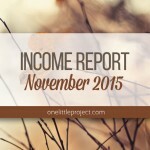 Although, in all fairness, I had to take a few months off from blogging and you can read all about it in my April 2016 Income Report. 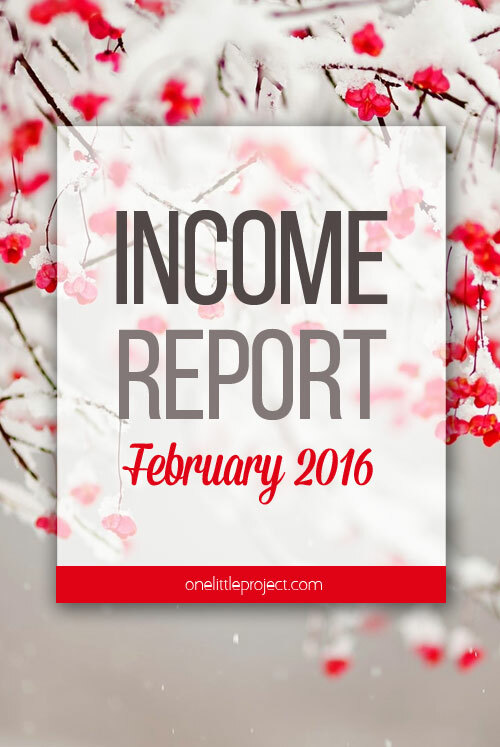 So since I’m writing the February and March reports so late, this income report won’t be quite so detailed. But it includes all the basics, and definitely shows you how One Little Project did in February. Traffic was way down from the December numbers and down even from the January numbers. Let’s just say, traffic is going down in general at this time of year. People aren’t looking at Christmas posts anymore. They seemed to be not overly fond of Valentine’s Day this year (as they were apparently very comfortable telling me on my Facebook page…). My older Valentine’s Day posts still performed fairly well, traffic wise, but traffic is taking a downward turn. Here’s hoping it picks up again soon so I don’t have to wait until the fourth quarter! I published 6 new posts in February. Which isn’t actually as bad as I thought it would be. I tried to follow my editorial calendar, but I was working part time at my day job and I only had one day off each week to do the blog projects, photograph them and write the posts. One day just isn’t enough time for everything that needs to get done. I still had almost half a million pageviews in February, which works out to about 17,000 pageviews per day on average. I’m still really happy with those numbers! One of the larger Facebook pages shared my Pretzel Bunnies and Ducks post on February 21st, which is where you see the spike below. It’s just more proof of why I believe working on your Facebook following can be so powerful! Yes, I love Pinterest and I still get the majority of my traffic from Pinterest. But when things go viral on Facebook, traffic goes through the roof! Here are the most popular posts from February based on pageviews. One Valentine’s Day post in there, but that’s pretty much it. My RPM is slowly creeping back up, which is great! It bottomed out in January at $5.44. But it climbed back up to almost $7 this month, which is not too shabby at all! My traffic is going down, but my RPM is going up, so overall, my income actually went up compared to last month. 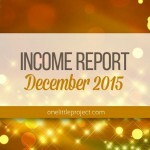 There… did you forget that I wrote this income report 4 months late? I did my best to remember a few things, but I can barely remember yesterday, let alone 4 months ago. So I’m truly sorry that this income report is a little bare. Now all I’m missing is the March 2016 income report and I’ll be all caught up!